“No party has questioned that the alternative to the 363 Transaction is liquidation – or presented any facts to controvert the Debtors’ showing that in liquidation — the unsecured creditors would receive no recovery. No party has questioned the draconian consequences to employees, suppliers, dealers, communities, and the overall U.S. economy if the 363Transaction is not consummated. Virtually no dealers have objected and, in fact, in excess of 95 percent of all dealers have agreed to new ongoing participation or wind-down agreements to be assumed by the Purchaser. “No party or person has expressed an interest or proposed a higher or better offer or any other financing proposal,” the GM brief noted. GM’s brief also observed that the automaker had the right to leave behind claims by victims of past accidents. “To alleviate certain concerns that have been raised on behalf of consumers as to future products-liability claims” the new GM will assume the claims of victims driving GM vehicles “regardless of when the product was purchased,” GM said. The brief also outlined GM’s plans to assume all liability under the so-called Lemon Laws, “for additional repairs, refunds, partial refunds, or replacement of a defective vehicle, and for regulatory obligations under such laws,” though not for punitive damages, it said. 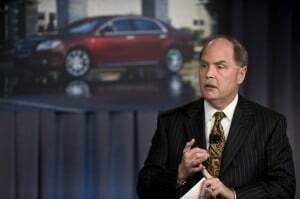 Fritz Henderson, GM’s chief executive officer, has said GM still expects to emerge from bankrutpcy by the end of the summer a “smaller, leaner” company with a faster decision-making process. A major hearing on creditor’s objections to the emergence plan is set for next week.